Just when you thought the awards might be over, they keep coming. The Associated Press announced its All Bowl Team, as reported yesterday by 247sports.com. 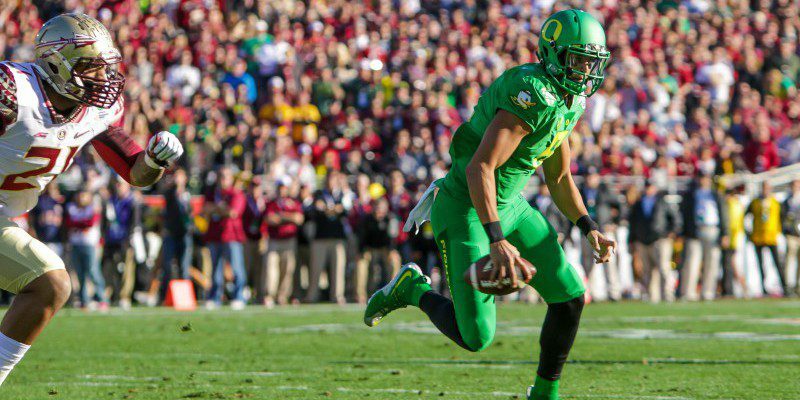 And as expected, Marcus Mariota was selected as the most valuable bowl season quarterback. To go along with Mariota, Troy Hill was selected as one of two cornerbacks, further helping to represent the University of Oregon. You might say that this award is somewhat meaningless, and in the grand scheme of things, it probably is. What it does show, however, is that even against stiff competition, Mariota and Hill rise above and out-perform the competition. We all know the capabilities of Mariota, and he definitely showed signs of further improvement in the utter dismantling that was the 2015 Rose Bowl against Florida State. On the other side of the ball, Hill helped to subdue, what many people believed to be, the toughest receiving core Oregon has faced all year. Without Ifo Ekpre-Olomu in the lineup, Hill was the next guy up; he certainly answered the call. The Ducks are set to face Ohio State in the National Championship in Dallas on January 12th. Despite blowing out its last two opponents, the Ducks must be wary of its competition. The Buckeyes had three players selected to this All Bowl Team: running back Ezekiel Elliott, offensive tackle Taylor Decker, and linebacker Darron Lee. Like earlier stated, this hypothetical all-star team does not mean much in the grand scheme of things, but from a fans’ perspective, we can look at this and feel thankful that we get to watch the two best teams in College Football, both loaded with talent, compete for the first ever National Championship in this new College Football Playoff system. It’s sure to be an epic time in Dallas. Stay tuned to FishDuck.com for all the latest news leading up to the National Championship on January 12th.